Numbers - The numbers are three-color tackle-twill numbers with black on white on bronze for home and bronze on blue on white for the road jerseys. The numbers are layered so that there is only one full layer. The home jerseys have the black layer on the bottom, then a thin bronze outline sewn on top of the black and then a very thin white outline layer on top. The road black jerseys have the bronze layer on the bottom with an outline of white and then a thin outline of blue on the top. Namebar - The letters are three-color tackle-twill letters in the same color scheme as the numbers attached to a namebar made of Airknit material. The letters are layered exactly like the numbers. Tagging Neck - There is a small CCM manufacturers tag in the neck of the jersey. There is also a small size flag in the neck. Tagging Collar - The manufacturer's logo (CCM-home, Koho-road) is located on the back of the jersey above the nameplate. Tagging Side - There is a larger CCM manufacturers tag in the side of the jersey. Tagging Hem - The silver and black NHL shield is embroidered on the right side of the tail of the jersey. Set 1 - The set stamp for set 1 reads in part "Washington Capitals, Doug Shearer Equipment Manager, Set 1, 2000-2001". This stamp is a patch sewn in the back hem. There is a second type of set stamp for set 1 that reads "Set 1/2000/2001 Customised by Cutting Edge Sports for the Washington Capitals". This type of stamp is stamped behind the crest. Set 2 - I have not seen a set stamp for any set 2 jerseys. Fight Strap - Nylon base sewn onto jersey with velcro and snap fight strap. Notes - Some of the players wore their black third jerseys from 1997-98 or from 1998-99 instead of being issued new jerseys for 1999-00. The third jersey was worn a total of 25 times in the 1999-00 season and then also in the playoffs. Preseason - not sure yet. Set 1 - Set 1 was worn until the end of February. Set 2 - Set 2 was worn from early March until the end of the playoffs. Tagging Neck - There is a small tag in the neck of the jersey, with the Canadian flag on it. There is also a small size flag in the neck. Goalie jerseys have a Canadian flag tag with "Goalie Style" printed on it. Set 1 - The set stamp for set 1 has the Capitol dome logo and reads "Customized by Cutting Edge Sports for the Washington Capitals Doug Shearer Equipment manager Set 1 2001-2002". The home jerseys have the set stamp either behind the crest, in the sleeve or both and sometimes the year 2001-2002 is upside down. Set 2 - The set 2 stamp is the same as the set 1 stamp and is behind the crest for the home white jerseys. Set 1 - Set 1 was worn until late-February or early-March. Set 2 - Set 2 was worn from late-February or early-March until the end of the season. Namebar - The letters are three-color tackle-twill letters in the same color scheme as the numbers attached to a namebar made of Airknit material. The letters are layered exactly like the numbers and are 4 inches tall. 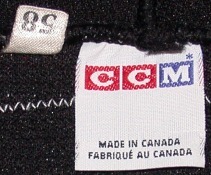 Tagging Neck - There is a size tag in the neck which has a Canadian flag, the words "Made in Canada" and the size of the jersey on it. Tagging Side - There is a manufacturer's tag in the side of the body of the jersey, which has washing instructions on it in three languages. Tagging Meigray - There is a tag in the back hem of the jersey which indicates the Capitals participation in the NHL-Meigray game-worn jersey program. Each jersey has its own serial number to document its authenticity. There is a set stamp in the back hem of the jerseys which has reads "This Jersey has been exclusively customized by Cutting Edge Sports for The Washington Capitals" It also as the set number and "Equipment Manager: Doug Shearer 2002-2003" along with a stamp of Doug Shearer's signature. Goalie jerseys usually do not have the set stamp. Notes - When longtime Bauer employee Ray Jones died early in 2003, the Caps' customizer, Cutting Edge Sports, honored his memory by adding his initials, RJ, inside some set 3 jerseys. Namebar - The letters are three-color tackle-twill letters in the same color scheme as the numbers attached to a namebar made of Airknit material. There is a set stamp in the back hem of the jerseys which reads "This Jersey has been exclusively customized by Cutting Edge Sports for The Washington Capitals". It also has the set number, the year and "Equipment Manager: Doug Shearer" along with a stamp of Doug Shearer's signature. Goalie jerseys usually do not have the set stamp. Notes - In 2003-04, teams switched to wearing their white jerseys on the road and colored jerseys at home. Season canceled due to lockout. Namebar - The letters are three-color tackle-twill letters in the same color scheme as the numbers attached to a namebar made of Airknit material. The letters are 3 1/2 inches tall. Tagging Collar - The Reebok logo is located on the back of the jersey above the nameplate. Tagging Meigray - There is a tag in the back hem of the jersey which indicates the Capitals participation in the NHL-Meigray game-worn jersey program. Each jersey has its own serial number to document its authenticity. All 2005-06 jerseys have tagging for the 2004-05 season which never took place because of the lockout. A 2005-06 season tag was added by Meigray to correct the problem. There is a set stamp in the back hem of the jerseys which has contact info for Cutting Edge Sports and also reads "Has created and manufactured the numbering and lettering for the Washington Capitals Set#1 2005-2006 Equipment manager: Doug Shearer". Set 1 white - 3 jerseys (2 were worn for a single game and were cut up by card companies). There is a set stamp in the back hem of the jerseys that shows the jersey was customized by Cutting Edge Sports, the year and the set of the jersey, as well as the Capitals trainer's name. Alex Ovechkin's jerseys have a slightly different tag which specifically has his name on it. Numbers - The numbers are two-color tackle-twill numbers with red on blue for the road whites and white on blue for the road reds. Namebar - The letters are two-color tackle-twill letters in the same color scheme as the numbers attached to a namebar made of mesh material. Set stamps were only used in the set 2 jerseys. Players who wore 2 or more jerseys per set only had a stamp in 1 of the set 2 jerseys. Notes - The 2007-08 season was the first season for Reebok's Rbk Edge Jersey System. The Edge jerseys differed from set 1 to set 2. For set 1, the jerseys consisted mostly of Reebok's 4way Stretch Pique material (version 1.0). The waterproofing of this material was not well accepted by the players and the material was replaced in set 2 by Air-Knit material (version 2.0). Not all players switched to the 2.0 version of the Edge jersey. Some continued to use the 1.0 version. Some players wore more than 1 home and 1 road jersey per set. Set Stamps - Set stamps were not used. Notes - Mike Green and Sergei Federov wore the 1.0 version of the Edge jersey. Several players wore 2 or more jerseys in set 2, including Ovechkin, Alzner, Green, and Semin. 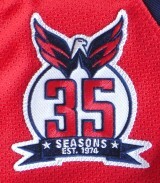 Patches - 35 Seasons - On March 6, 2010, the Capitals wore a patch on a new set of home red jerseys to commemorate their 35th season. The jerseys with the patch were worn only once and were auctioned after the game. Notes - Most players wore 2 jerseys of each color in set 1. Mike Green wore the 1.0 version of the Edge jersey.